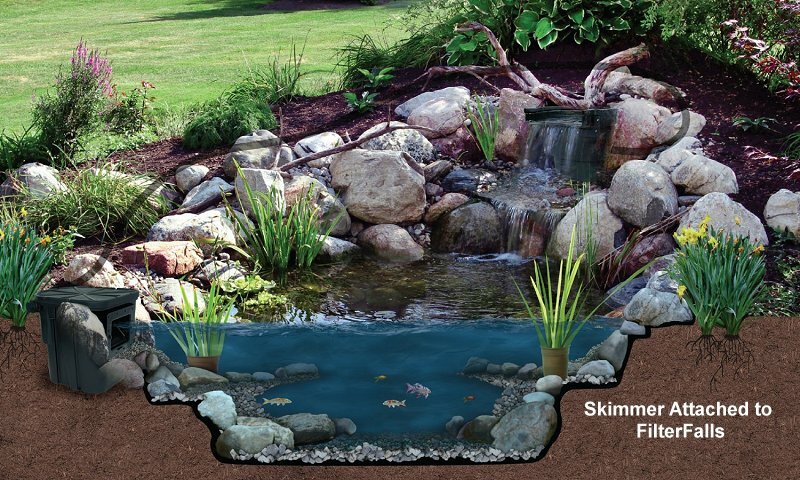 Learn about Pond Skimmers and how to choose the best one for your pond. The skimmer is employed to collect and dispense with the debris that falls into the pond or floats on the top of the pond before it clogs the pump or drops to the bottom where it will decompose and create toxins that are not healthful for the pond environment or its occupants. It also pulls the film that accumulates off of the top of the pond to keep its surface pristine. The weir is a small trap door in the front of the skimmer. The top of the door aligns just below the water's surface, using the surface tension to drag water into the skimmer. The bottom of the door opens and lets water and debris into the skimmer. Given sufficient power, it will skim the surface of the pond nearly as deep as the door is tall. All skimmers have a filter area where they hold the larger debris and where some further trap smaller particulates. A net and or brush traps larger debris (mechanical filtration only). Some advanced units also contain a trap for smaller particulates that has sufficient surface area to also accomplish some biological filtration (with the proper media) as the water passes the filter bed. The optimum filer will accomplish both mechanical and Biological filtration. 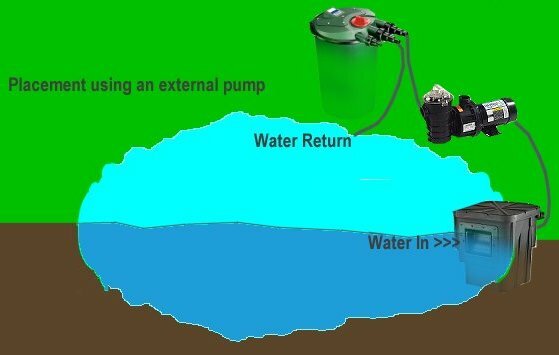 Garden Pond skimmers usually house (and include) a submersible pump and contain everything needed to clean the water surface inside the skimmer including filter media. 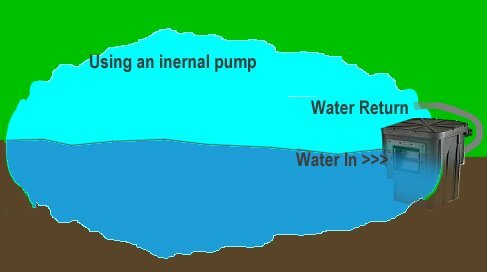 Sometimes both must be purchased separately or the skimmer will be designed to attached to a more powerful external pump via an intake inside of the skimmer body. Choose a skimmer that has a similar flow rate as the pump you are using, or match the two when you purchase. Most skimmers are not meant to be the entire filter system unless they specify that they are a combined unit. 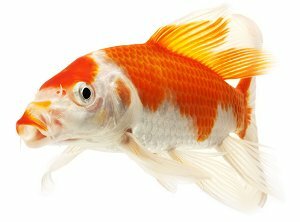 However, they can be in important supplement to a filter or a waterfall, adding more filtering power to your pond while keeping the surface clean. The placement of the skimmer is usually along the edge of the pond. Some, such as the satellite filters can sit in the pond (on a built-up foundation) or buried at the edge of the pond with just the weir-side opening into the pond itself. Most have easy-to-open lids that allow cleaning of traps easily and quickly. The frequency of cleaning depends on how much debris falls into the pond. If you have a lot of trees, or if it is autumn, you will be cleaning more rather than less. Now might be a good time to notice that "cheap" skimmers are made of plastic that does not hold up to ultraviolet light or freezing (brittle) and thawing temperatures. 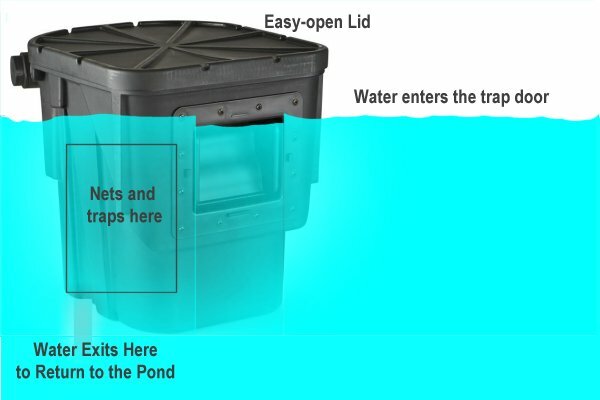 Choose a quality pond skimmer with a good reputation and guarantee. Fish safety is accomplished with a gate-keeper that lets leaves pass but stops fish and frogs from entering the skimmer. It is usually a separate purchase. Some skimmers can be combined with waterfalls.